« What the hell am I doing?? is HELLA cheaper, but would take up more room. And it seems portable electrolytes = good. The tub is 80 servings for fourteen bucks, the individual ones are 48 servings for $53!!! I wonder about getting gel caps and making electrolyte pills….then there’s those NUUN tablets. 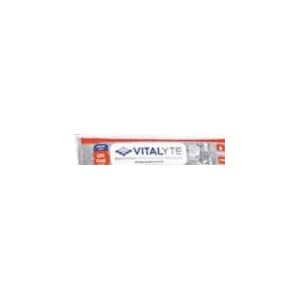 I was going with Vitalyte cuz Brody told me too! Ingredients: glucose, citric acid, potassium chloride, sodium bicarbonate, dibasic potassium phosphate, ascorbic acid, sodium chloride, magnesium gluconate, calcium gluconate, natural citrus flavor, and natural color (annato). This entry was posted on July 28, 2010 at 8:45 PM and is filed under Uncategorized. You can follow any responses to this entry through the RSS 2.0 feed. You can leave a response, or trackback from your own site. To save room, you could take just a portion of what’s in the tub and put it in a smaller container. You won’t need all 80 servings will you? I got a box of emerg-c to take.